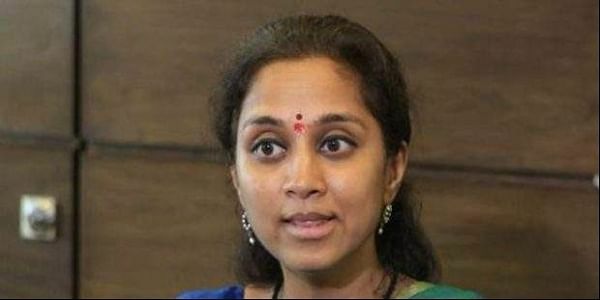 A case was today registered against a Twitter user for allegedly posting objectionable tweets against NCP MP Supriya Sule on the micro-blogging site, the city police said. THANE: A case was today registered against a Twitter user for allegedly posting objectionable tweets against NCP MP Supriya Sule on the micro-blogging site, the city police said. The case was registered at Vartak Nagar police station, based on a complaint filed by NCP MLA Jitendra Awhad yesterday. "A case was registered against one Walchand Gittee for allegedly posting offensive tweets against NCP leader Supriya Sule," a police officer said. Vartak Nagar police booked Gittee under IPC sections 354 (d) (stalking), 509 (word, gesture or act intended to insult the modesty of a woman) and 500 (defamation), and section 67 of the IT Act. In his complaint, Awhad said that the accused made objectionable tweets against Sule on her Twitter handle, police said. "The offensive messages have hurt the feelings of NCP workers," the legislator said in the complaint. No arrest has been made in this connection so far and further investigation is on, police said. Sule, daughter of NCP chief Sharad Pawar, is a Lok Sabha MP from Baramati constituency in Maharashtra.